At a certain point in the late middle of my life I made the unexpected but happy discovery that the answer to several of the questions that most occupied me was one and the same. There are lots of reasons to buy organic foods: Studies show they’re better for our health and the planet. But with a little planning, cooking organic food can save money and time, help you eat better, cut down on waste and help protect the environment. EWG researchers were inspired by celebrity chef Jamie Oliver's demonstration and challenge: “Would you like to be quicker and cheaper than a takeaway?” So we crunched the numbers, chopped the onions and waited in lines. We found that – with help from our own online tools – many typical households could afford to eat organic food regularly for about a third of what the average American spends eating out. The key is planning your meals and cooking at home. It saves money, cuts down on waste, helps protect the environment and is just as fast – if not faster – than eating out. Bonus: Home-cooked meals tend to be healthier than take out. A third party must certify food labeled organic to ensure that it meets criteria set by the U.S. Department of Agriculture. These standards work to protect natural resources, preserve agricultural biodiversity, and support animal health and welfare. Organic produce packs more disease-preventing antioxidants and carries far less pesticide residue than conventional produce, which is grown with massive applications of pesticides and other chemicals. Organic farming methods protect water, soil, bees and other helpful insects, as well as the health of farmers, farmworkers and neighbors. Organic meat and dairy products, especially from pasture-raised animals, have a healthier balance of fats than conventionally raised animals. Animals that aren’t given unnecessary antibiotics tend to have fewer bacteria that can cause untreatable infections. But can people really afford to eat organic on a typical budget? EWG found that the average cost of eating out is three times the cost of cooking, no matter how you eat. 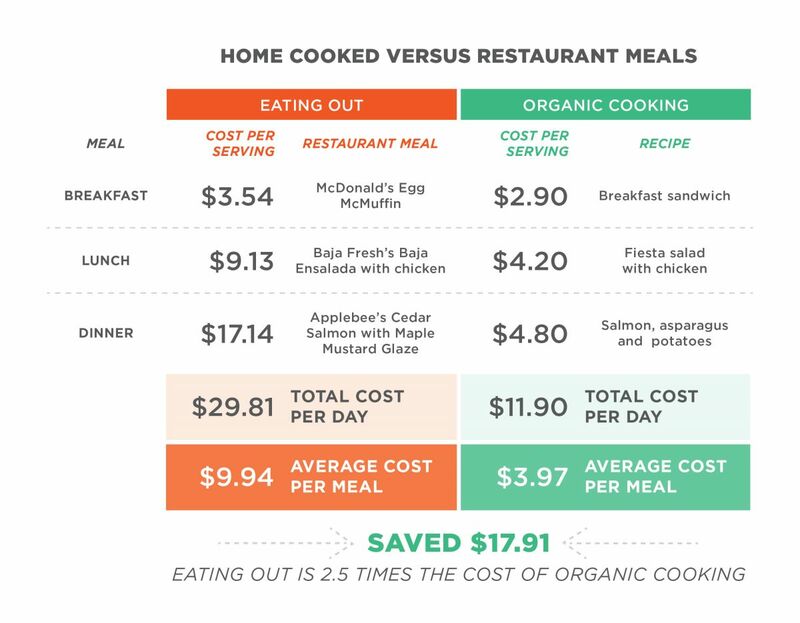 EWG staff members visited stores and restaurants in April of 2017 and compared the costs of organic ingredients and popular restaurant meals. EWG obtained organic food prices from a Kroger supermarket in Ventura, Calif. (for details see EWG’s Shopping Lists). For items Kroger didn’t carry, we used prices at the nearby Whole Foods’ Oxnard, Calif. store. EWG found that many American households could afford to eat organic regularly if they chose to cook more. Cooking, even with all-organic ingredients, is about a third of the cost of eating out. Three organic meals cooked from scratch totaled $11.90, averaging $3.97, while the equivalent non-organic restaurant meals (an Egg McMuffin from McDonald’s, the Baja Ensalada from Baja Fresh, and the Cedar Salmon from Applebee’s) totaled $29.81, averaging $9.94 per person per meal. That’s two and a half times the cost of cooking fresh, organic versions of these meals at home. What about the all-important resource: time? Most people say they don’t cook at home because they don’t have time.19,20,21 The food industry promotes the myth that cooking takes too much time and skill.22 There’s no denying that cooking takes time, but how much? 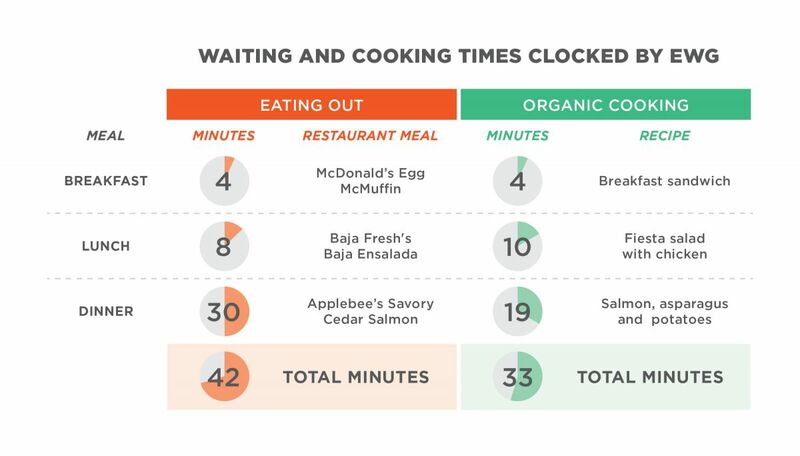 EWG discovered that eating out takes just as much time, and sometimes more, than cooking at home. “Eating out takes just as much time, and sometimes more, than cooking at home. For starters, driving or walking to a restaurant takes a few minutes, maybe longer. When you add up the time it takes to drive, order, and wait for your meal to be ready, getting food at a fast food place will take you 14 minutes.F At a casual restaurant, during peak dinner hours, the time to drive, wait to be seated, and served rises to 44 minutes.G If there is no wait to be seated, getting food at a casual restaurant can drop to 21 minutes, but depending on the conditions, it can take even longer for your food to be served.25 And this does not include the time it takes to eat, pay or drive on to your next destination. “When you add up the time it takes to drive, order and wait for your meal to be ready, getting food at a fast food place will take you 14 minutes. At a casual restaurant, during peak dinner hours…that rises to 44 minutes… but depending on the conditions, it can take even longer for your food to be served. Averages are well and good, but EWG staff wanted the raw numbers. So we conducted an experiment you can replicate. For lunch, an EWG staff member prepared a salad topped with chicken in 10 minutes. Driving to the nearest Baja Fresh for a similar meal took eight minutes, plus eight minutes to be served. For dinner, an EWG staff member cooked salmon, asparagus and potatoes in 19 minutes. In comparison, dinner at Applebee’s took 44 minutes in all: a 14-minute drive in rush-hour traffic, followed by 30 minutes waiting for the salmon to arrive. Generally, we found that over the course of a day, it took 42 minutes to eat out and 33 minutes to eat in. When you know that well-planned cooking, such as making soup, can produce several days of meals, it’s clear that eating out does not save time. As you get better at cooking and develop a repertoire of go-to recipes and timesaving tricks, your time spent cooking will decrease, and you’ll save even more time by cooking at home. A breakfast cooked from scratch can be on the table in less than 15 minutes, beating out a fast food run. You can make a breakfast egg sandwich in four minutes. There’s an oat solution to fit everyone’s morning, from overnight rolled oats, to old-fashioned oats, to one-minute oats, to even notoriously slow steel-cut oats. Lunch and dinner may take a little longer, but as Chef Jamie Oliver demonstrates, with a plan and the right skills, you can cook a fantastic meal in five minutes or less. Obviously, cooking at home could stretch out for hours if you let it, but with a few go-to meals and 10 minutes of planning time a week, you can easily beat both the time and financial costs of eating out. Research by USDA scientists, based on national survey data on more than 9,000 adults, found that people who eat out frequently are more likely to be overweight or obese than people who have most of their meals at home.32,33,34,35 That’s no surprise. Ample evidence shows that take-out and eat-out foods are usually high in empty calories and low in nutrients.36,37,38,39,40 On the other hand, when people make their meals at home41,42,43 and eat together,44 they tend to eat more healthful fruits, vegetables and whole grains. If you spent 10 minutes a week planning, you could save more than $2,000 year, according to research by the National Resources Defense Council.46 Find out exactly how much you could save at savethefood.com. Download EWG’s Good Food on a Tight Budget Meal Planner. Or make your own – it can double as a kid’s art project. 5) Use leftovers night and always have a back-up plan! A good meal plan uses one or two new recipes, two or three standbys, one leftover night and one back-up plan for hectic days. Have some go-to quick and easy plans for the nights when everybody is tired. Seasoned meal planners can figure out which leftovers work as lunch the next day or can be frozen for a future back-up meal. EWG’s Good Food on a Tight Budget Shopping List is a good place to start. You can find apps such as BigOven, FitMenCook, Paprika, Food on the Table, Plan to Eat, Menu Planner and others if you like to manage things electronically. One of the most exciting things about meal planning is saving money and food. Challenge yourself and calculate how much you save. Then tweet at us about it using the hashtag #OrganicWithinReach. Remember, fruits and vegetables should make up about 40 percent of a healthy budget (or about $11 of every $25 you can spend on food). Set aside some time to prep your produce for the week, either all at once or in smaller chunks. Doing some of the washing and chopping ahead of time makes a from-scratch meal come together faster. Those who enjoy cooking have better diets,47 so focus on fun! Put on your favorite radio station, podcast or audiobook. Cook with someone else and use it as a way to share your day. With kids, cooking is less about getting something done than spending quality time together and making the kitchen a special, comfortable and fun place to be. Keep little hands busy with tasks such as washing lettuce, shelling pistachios or peeling garlic (crush it with the side of a knife first to loosen the skin and let them take off the peel with their fingers). Think of it as an art project that you get to eat at the end! Tweet at us with your family’s fun kitchen ideas using the hashtag #OrganicWithinReach. Seasoned meal planners know all about the magic of slow and pressure cookers. They also savor the peace of mind that comes with having a meal tucked in the freezer for a busy day. Start small – you’ll get there. And think of all the time and money you’ll have saved! You can also get started with a meal planning service like Weelicious Menus. 1) Toast English muffin in a toaster. 2) Coat iron skillet lightly with about ½ teaspoon of olive oil. 3) Heat skillet over moderate flame. When pan is hot, crack egg lightly into frying pan and cook until bottom of egg begins to look cloudy (about 30 seconds). 4) Grab a cover for the skillet and put it near the stovetop. Then add a splash of water (about 1 tablespoon) to pan and cover immediately. 5) Cook egg through (about 1½ minutes). 6) Meanwhile, remove English muffin from toaster and place on plate. 7) Place one slice of American cheese on one half of the English muffin to lightly melt cheese. 8) Remove one slice of ham from package. 9) Once egg is cooked through, remove from skillet and place on top of the cheese slice to keep melting the cheese. 10) Add ham to skillet and warm (about 15 seconds on each side). 11) Remove ham from skillet and place on top of the egg. Top with the other half of the English muffin. Enjoy in moderation! 1) In a bowl or large mason jar, mix 1 tablespoon of olive oil, 1 tablespoon of balsamic vinegar, salt and pepper and your choice of spices to make a marinade (3/4 teaspoons each of chili powder, paprika, garlic and a little honey is a nice mix). 2) Using a chef’s knife and a cutting board designated for raw meats, slice chicken into equal sized strips. New in the kitchen? Jamie Oliver’s Knife Skills will teach you how to cut almost anything with just three basic knife techniques. 3) Add chicken to bowl of marinade and mix (or shake in closed mason jar) and set aside. Got more time? Marinate in refrigerator for an hour or longer. 4) Thoroughly wash your hands. 5) Wash 4 large leaves of lettuce, one tomato and 3 cilantro stems. Shake off the vegetables and set on towel to dry. 6) On a different cutting board designated for raw vegetables, chop one small corn tortilla and set aside. Cut the lemon in quarters and set aside. Slice the red onion into eighths and chop one section, then cross-chop the onion together with the cilantro and add this mix to a separate small bowl for the pico de gallo. 7) Chop lettuce and add to a salad bowl. Dice tomatoes and add one third of them to the salad bowl and the remaining tomatoes to the bowl for pico de gallo. 9) Heat an iron skillet to high. 10) Squeeze the juice of half a lemon into the pico de gallo and season to taste with salt and pepper. 12) Add 1 tablespoon of olive oil to the hot skillet and turn the heat down to medium. 13) Add sliced corn tortilla to iron skillet and cook, stirring occasionally for 1 minute. Using a spatula or tongs, place tortilla strips from pan directly into the salad bowl. 14) Add marinated chicken to iron skillet and spread out the slices so they have room to cook. 15) Thoroughly wash your hands again. 16) Sear chicken over moderate heat for 1 minute without stirring. Then flip the chicken and cook until it is no longer pink (another 2 to 3 minutes). Turn off heat. 17) Using a spatula or tongs, top the salad with your cooked chicken and pico de gallo. 18) Drizzle salad with olive oil and balsamic vinegar, and toss. Season to taste with salt and pepper or leftover cilantro. Sprinkle with cheese. Enjoy! Have 20 minutes and want to impress? Watch the Trust Me for Tender Chicken method from The Kitchn. If you’re new to pan-frying salmon, a read through the Perfect Salmon Tips and the Bad Salmon Playbook will be well worth your time. 1) Wash potato, asparagus and zucchini. Let asparagus and zucchini dry on a towel. 2) Quarter potato and place in a small sauce pan with enough water to cover the potatoes (about 1 cup). Cover and heat to a boil, then turn down to medium heat with the cover partially open. 3) Heat an iron skillet to high. 4) Add 1 tablespoon of olive oil to the hot skillet. 5) Season skinless side of fillet with a pinch of salt. Add room temperature salmon fillet with the skin side touching the skillet. Reduce the heat to medium-low immediately. 6) If the edges of the salmon begin to lift up, press gently on the fillet to ensure even cooking. 7) While the salmon cooks, slice lemon in quarters and set aside. Peel garlic and slice thinly. Slice zucchini in half lengthwise and then chop into half circles. 8) Add asparagus spears and zucchini to steam tray above the potatoes and cover. 9) Cook the salmon until the skin looks crisp and the flesh changes color to light pink 2/3 of the way up the fish—about 4 ½ to 5 minutes (slightly more or less depending on fillet thickness). Then flip the salmon by gently inserting spatula between the salmon skin and the skillet. If it doesn't release easily, let it cook longer. It will lift easily with a spatula when it’s ready. 10) Cook the salmon on the second side for about a minute, just to sear the top. Add sliced garlic to the side of the pan and saute. 11) Using a spatula, remove salmon and garlic from pan onto serving plate and set aside to rest salmon with the skin facing up. 12) Using a slotted spoon, remove zucchini from steam tray and add to skillet. Sear zucchini for one minute without stirring. 13) Using the potholder, remove zucchini from the pan and place alongside salmon on the plate. 14) Remove asparagus from steam tray and place alongside salmon and zucchini on the plate. 15) Turn off potatoes, and using a slotted spoon, remove from the boiling water and place directly onto hot skillet. 16) Add more olive oil if necessary and sear potatoes for one minute, not stirring. 17) Remove potatoes from pan using a spatula and place on plate. Turn off heat. 18) Season with salt, pepper and lemon juice as desired. Enjoy! [A] EWG calculation from U.S. Department of Labor, Consumer Expenditure Survey, 2014, for household of 2.5 people spending $3,971 a year for 17 meals a week at home. $3,971 divided by 52 weeks a year, divided by 2.5 people, divided by 17 meals a week equals $1.80 per person per meal. [B] EWG calculation from U.S. Department of Labor, Consumer Expenditure Survey, 2014, for household of 2.5 people spending $2,787 a year for four meals a week away from home. $2,787 divided by 52 weeks a year, divided by 2.5 people, divided by four meals a week equals $5.36 per person per meal. [C] The NPD Group, a market research firm, (http://npd.com/wps/portal/npd/us/news/press-releases/fast-casual-is-only-restaurant-segment-to-see-traffic-growth-in-2013-reports-npd) reported similar costs—a typical bill at fast food places such as McDonald’s, KFC and Burger King averaged $5.30 in 2013. But bills at casual chain restaurants such as Applebee’s and TGI Friday’s can climb even higher, averaging $13.66. [D] Travel time of four minutes calculated assuming an average city street driving speed of 35 miles an hour (2.4 miles divided by 35 miles per hour and converted to minutes by multiplying by 60). [E] Travel time of six minutes calculated assuming an average city street driving speed of 35 miles an hour (3.3 miles divided by 35 miles per hour and converted to minutes by multiplying by 60). [F] According to http://qsrmagazine.com/reports/drive-thru-performance-study-2014: research by the fast food industry news organization, QSR Magazine, in its 2014 Drive-Thru Performance Study, there is an average waiting time of 6 minutes in the queue to order at a drive-through, and a three and a half minute wait time from placing an order to being served at a drive-through. Including the 4-minute drive to a fast food place, picking up fast food requires 14 minutes in total. [G] A (http://fastcasual.com/press-releases/lrs-releases-study-results-on-average-restaurant-wait-times) survey conducted by the restaurant pager supplier, Long Range Systems, LLC, found that the average wait time to be seated at a restaurant at during peak hours was 23 minutes. The time from placing an order to being served averages 15 minutes for dinner, according to a survey commissioned by researchers at Texas Tech University. Including the average 6-minute drive to a sit down restaurant, going out for dinner requires 44 minutes in all. [H] The time you need to cook a meal decreases as your skill level increases. An EWG staff member with no experience with the recipes we chose cooked all the meals, ensuring the cooking times would be realistic for beginning cooks. [I] We selected meal times (breakfast 8:09 a.m., lunch 12:43 p.m., and dinner 6:22 p.m.) based on averages (http://ncbi.nlm.nih.gov/pubmed/25088521) reported by adult Americans to the National Health and Nutrition Examination Surveys, 2007-2010, conducted by the CDC. [J] The average drive to grocery stores is 1.9 miles, according to GPS monitoring (https://www.cdc.gov/pcd/issues/2015/15_0065.htm) data of 241 adults in five U.S. cities collected by scientists at RAND. Round-trip travel time of 6.5 minutes calculated assuming an average city street driving speed of 35 miles per hour (1.9 miles divided by 35 miles per hour multiplied by 60 and multiplied by two for the round trip). [K] The average company service time quality standard for return of payment is three minutes, according to a (http://digitalcommons.fiu.edu/hospitalityreview/vol24/iss1/5) survey of eight chain restaurants commissioned by two researchers at Texas Tech University and collected through an anonymous shopper program. 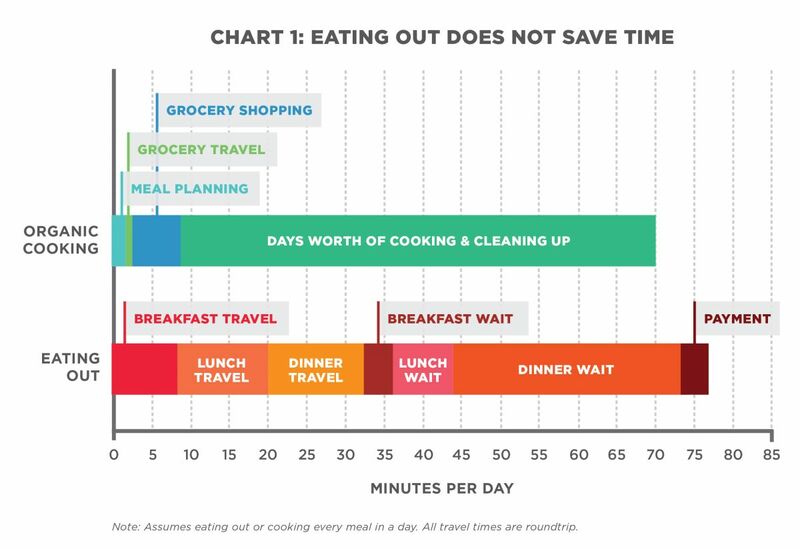 [L] Assuming meal planning takes 10 minutes a week, the average time spent meal planning each day is 1.4 minutes, (10 minutes divided by 7 days). [M] The Economic Research Service (http://www.ers.usda.gov/publications/pub-details/?pubid=44609") calculated the average time spent grocery shopping time to be 44.3 minutes [Table 6], according to data collected by the U.S. Department of Labor's Bureau of Labor Statistics for the 2006-2008 American Time Use Survey. Assuming a shopper obtains a week’s worth of groceries in one trip, the time spent a day is 6.3 minutes (44.3 minutes divided by seven days). [N] The average time spent for those who both cook and clean up is 61.5 minutes a day, according to (http://www.ers.usda.gov/publications/pub-details/?pubid=44609) calculations by the Economic Research Service [Table 7] using data collected by the U.S. Department of Labor's Bureau of Labor Statistics for the 2006-2008 American Time Use Survey. [O] The Economic Research Service (https://www.ers.usda.gov/publications/pub-details/?pubid=45302) calculated [Figure 1] that Americans average 14.1 minutes a day “eating and drinking out” using data collected by the American Time Use Survey. 14.1 minutes a day multiplied by 365 days is 5,147 minutes, or 86 hours. [P] EWG calculates that if Americans eat out at a fast food restaurant twice a week, 14 minutes each time, and twice at a casual dining restaurant, for 44 minutes each time, that adds up to 116 minutes a week. 116 minutes a week multiplied by 52 weeks a year is 6,032 minutes, or 101 hours. M.A. Beydoun et al., Reduced Away-From-Home Food Expenditure and Better Nutrition Knowledge and Belief Can Improve Quality Of Dietary Intake Among U.S. Adults. Public Health Nutrition, 2008, 12(3):369-381. L.P. Smith et al., Trends in U.S. Home Food Preparation and Consumption: Analysis of National Nutrition Surveys and Time Use Studies from 1965-1966 to 2007-2008. Nutrition Journal, 2013, 12:45. A.K. Kant et al., Away From Home Meals: Associations with Biomarkers of Chronic Disease and Dietary Intake in American Adults, NHANES 2005-2010. International Journal of Obesity, 2015, 39(5):820-827. U.S. Department of Labor Bureau of Labor Statistics, 2014. L.P. Smith et al., 2013. C.A. Monteiro et al., Increasing Consumption of Ultra-Processed Foods and Likely Impact on Human Health: Evidence from Brazil. Public Health Nutrition, 2011, 14(1):5-13. A. Lichtenstein and D. Ludwig, Bring Back Home Economics Education. Journal of American Medical Association, 2010, 303(18):1857-1858. J.L. Liu et al., Beyond Neighborhood Food Environments: Distance Traveled to Food Establishments in 5 U.S. Cities, 2009–2011. Preventing Chronic Disease, 2015, 12(E126):1-9. K.S. Hamrick and A.M. Okrent, 2014. S.A. Bowman and B.T. Vinyard, Fast Food Consumption of U.S. Adults: Impact on Energy and Nutrient Intakes and Overweight Status. Journal of the American College of Nutrition, 2004, 23(2):163-168. A.K. Kant et al., 2015. S.A. Bowman and B.T. Vinyard, 2004. M.A. Beydoun et al., 2008. D. Crawford et al., Which Food-Related Behaviours Are Associated with Healthier Intakes of Fruits and Vegetables Among Women? Public Health Nutrition, 2007, 10(3):256-265.